If you don't already have an up to date financial plan, you've come to the right place! Creating (and regularly updating) your financial plan can be the single most important financial decision of your entire life (maybe even your family's entire lives)! Let's take a brief look at the 5W's (OK, 4 W's and an H) of creating your financial plan. Who? - Who should be involved in creating my financial plan and can't I do this on my own? Let's start with the second question and go from there. Yes, you most certainly can create your own financial plan. The advantage of working with a financial planner is you benefit from their education and experience. This means your planner will ask you questions that you might not know to ask yourself (sometimes these can be difficult questions). Your planner can also help you tweak your plan so you have a better chance of attaining your financial goals (sometime it's hard to do this for yourself because everything is so personal and close to you). Your planner is also most likely to have software that is more sophisticated than the software available to the general public. Working with a planner will also get the plan up and running in less time than you doing it yourself because of his/her experience. Your planner can also help you tie your investment strategy to your financial plan. As for who, that's a highly subjective question. Some of the families we work with have one family member that handles the household finances and planning tasks, others include the entire family in the process, including children. Most families, however, it's just the couple (or individual) that get's involved in the process. What? - What will a financial plan tell me when it's complete and what will it cost me to have a plan created? The old adage "you reap what you sow" could not be more applicable than it is here. The more you put in to your plan the more you will get out of it. For example, a well crafted financial plan is not just a report that tells you what your "magic number" is and how much you can spend a year while retired. A thorough financial plan will guide you as to how aggressive, conservative or balanced your investments should be, how much you need to be saving to meet your goals, when you can retire, and what effect inflation is likely to have on your retirement. How to budget for goals and life events (kids college/weddings...) as you work your way towards retirement. If you have the correct amounts and types of insurance coverage. Our clients often comment that working with us to create their plan helped them not only envision their retirement but they discovered goals they never realized they had. Of equal importance, a good financial plan will allow you to ask "What if..." and see how different decisions will affect your plan. A well thought out financial plan is as valuable during your working years as it is during your retirement years. 95% of the plans we create for our clients cost $2,500.00. There are those few that cost more because of additional time needed to get data entered and goals created and modified. It's quite rare that we charge more than $2,500.00 and we always have a signed agreement and an agreed upon fee beforehand. When creating your financial plan we require a 50% deposit and ask that the remaining balance be paid when the plan is presented to you. When? - When should I get started with my financial plan? Is it too late to create my financial plan? Now! It is never too early to start planning for your future. Look at it this way, the sooner you start planning out your financial future the easier it should be to achieve your goals. Not to mention the peace of mind that comes with knowing whether you are on track or not. The earlier you start your plan, the smaller the adjustments made going forward tend to be. It's almost never too late. The longer you wait, the less time you have to make any needed adjustments going forward. So, earlier is always better. Why? - Why can't I just start to accumulate some investments (401(k), IRA Stocks, Bonds, Mutual Funds...) and worry about creating a plan when I'm closer to retirement? Why should I hire J. 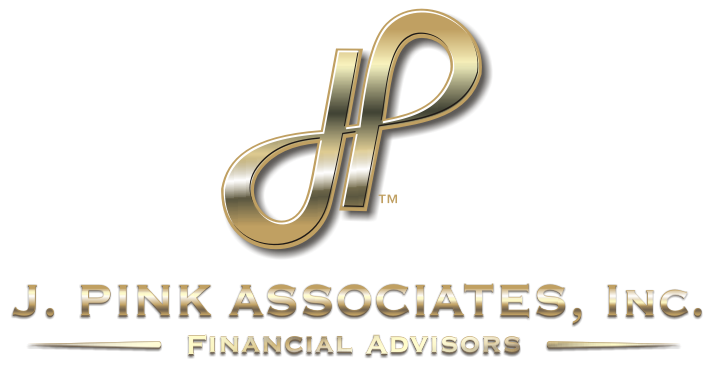 Pink Associates to help me create my plan? Having a plan in place first will help you choose the investment mix that is best suited to your personal situation. Having a plan also gives you a benchmark to measure your progress. Just like you would most likely use some form of navigation system (or map) if you were going on a long road trip, a properly completed financial plan is your financial road-map from today to and through retirement. Why hire JPA? We take the time to not only help you set up your plan, but we also enjoy helping you quantify your goals and the associated timelines. Once you have your goals spelled out, we will help you prioritize them so you can direct your financial resources toward your most important goals (needs) first and your less important goals (wants and wishes) after your needs are addressed. This is a very personal process to you and the importance of this is paramount to us as well. A happy client with a well crafted financial plan is not only very important to us, it's our best (and only) form of advertising. We want to be the firm you brag about when you are talking with your family, friends and co-workers. "Family Focused" is not a tagline, it's how we approach each and every one of our client relationships. How? - How do I get started? How much of my time will this take? Getting started is easy, just call our office and set up an appointment to meet with us so we can discuss how to help you get your financial plan in place. Again, you reap what you sow, that being said, this certainly does not need to be a time consuming/wasting affair. We understand that your busy and are being pulled in many directions at the same time. Typically the first meeting is more of an opportunity for us to meet each other. We want you to get a chance to know us and share your expectations with us. Once you have decided to work with us, we will put together the paperwork necessary to get things moving. This paperwork will also tell you exactly what your financial plan will cost. Most people don't like surprises, we agree, that's why we make sure we are all in agreement before we move forward. Our next step (usually the same meeting as when we complete the engagement paperwork) we will go over your statements, your budget and discuss your basic timeline to retirement. This is when we want you to share your dreams with us. We will use those dreams so we can start to map out your goals. This is typically a two hour meeting. After that meeting we roll up our sleeves and get to work on building your plan. We add your assets, debts and build each of your goals in to your plan. When the first draft of your plan has been carefully constructed and thoroughly reviewed, we will invite you in so we can present your plan to you. While presenting your plan, we will take advantage of our time together and refine and finalize your plan and goals as we review them. Are there any other things I should know/ ask about getting started on a financial plan? Can I view my plan online? Absolutely, once you plan has been presented to you, we will set you up with internet access so you can access it at your leisure 24/7. Can you show me a sample financial plan so I have a better feel for this? Absolutely! click HERE to watch a short video that will give you a better feel for what our finished product looks like and shows some of the functionality. Can't I get a financial plan cheaper somewhere else? Yes, you certainly can. Clients bring us less thorough plans to look over with them quite frequently. They are often quite unsophisticated and fail to address many of the critical components that make a good financial plan. The old adage "you get what you pay for" rings true here, for sure. What if I discover I have other goals after my plan has been created? No problem, we expect that your plan and your goals will continue to evolve as time goes by. Once we update your goals you can log in and see how your new goals have changed your plan. Once changes have been made, can we go over those changes together? Yes, we can either schedule an appointment to meet and review the changes or we can look together online. Our software has the capability for us to both be logged in to your plan simutaenously for just this reason.